Welcome to Critic's Notebook, a quick and off-the-cuff car review consisting of impressions, jottings, and marginalia regarding whatever The Drive writers happen to be driving. 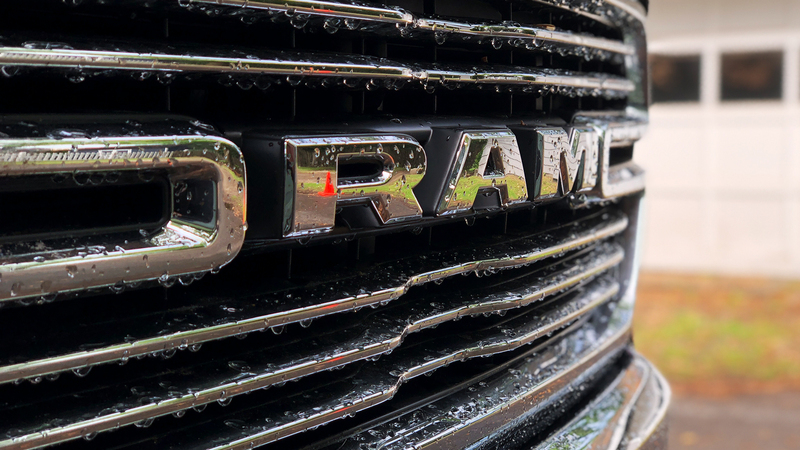 Today's edition: the 2019 Ram 1500 Laramie Crew Cab 4x4. Growing up, my dad always owned trucks. He's a mechanic in Pittsburgh, and he had an honest use for them. He's a guy who once bought a dump truck on eBay because he actually needed a dump truck, then promptly sold it when his need for it evaporated. My dad is man of utility, and he believes in having the right tools. Undoubtedly, his mindset has been passed down to me—it's ingrained in how I think about what my team needs to produce videos, and it's increasingly coloring how I'm looking at vehicles. But we're spoiled in today's world, because you can demand more than just function from your vehicle. You can require fashionable technology and you can lust after beautiful design too—and you can even find all of it in some of the most capable brutes of the automotive world. Like the all-new Ram. Now that a week of driving the 2019 Ram 1500 Laramie Crew Cab 4x4 is over, I find myself falling victim to nostalgia for something very recent. I miss the truck—and that's without having completed any sort of life-altering, limit-testing adventure with it. Instead, I used it the way many truck owners now use their pickups—for the daily grind of everything. I carted Spartan Race supplies (and myself) to upstate New York out of what can only be described as masochism, I commuted from New Jersey to South Brooklyn for work, I hauled domestic goods away from both Home Depot and Whole Foods, and I picked up friends and their luggage at the airport. And while smoothly sailing my Red Pearl Ram (and I do mean smoothly), I couldn't help but think back on my times behind the wheel of my dad's old pickups. The mental juxtaposition of those rough old truck-driving experiences against the feeling of piloting this civilized monster emphasized just how much new pickups—and this next-generation Ram 1500 in particular—have evolved. As something of a tech nerd, I was impressed with the USB ports sprinkled throughout the cabin. My ride came with two specifically in the switch bank, but Ram notes you can have up to five, most of which integrate USB-A and the newer USB-C that allows for ultra-quick charging. Ram has engineered the 2019 1500's cabin to be extremely quiet, which only adds to the luxurious feel. The cabin has been expanded by four inches, which means second-row passengers enjoy an astounding 45.1 inches of leg room in the crew cab. I carried no Goliaths, but my normal-sized passengers were all impressed with how much space they had. 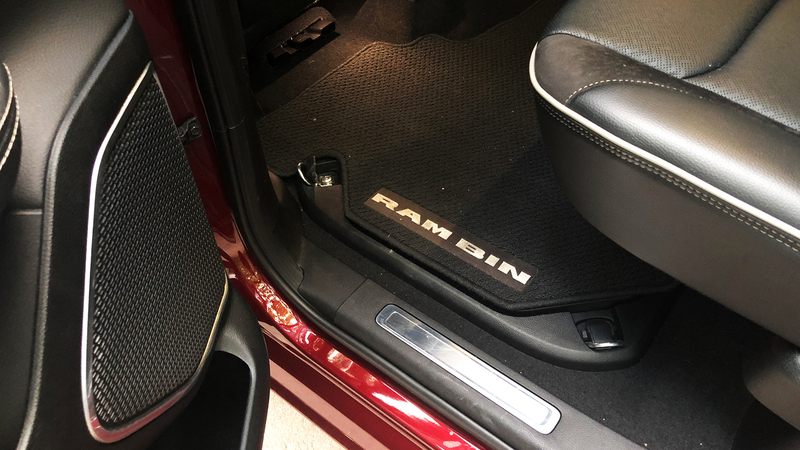 Under the feet of those backseat riders lies a flat-load floor that houses two Ram Bins (each expanded by 5.5 inches in comparison to the outgoing model), which provide even more built-in storage. The luxury SUV comparisons don't stop at the interior—they extend right into the way this big boy drives. 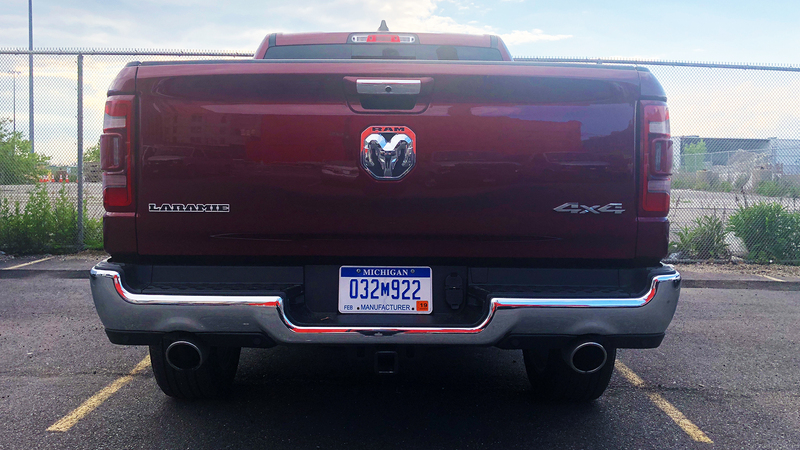 Ram put the new generation 1500 on a diet, slashing 225 pounds compared with the old one—with 100 of those coming out of the 98-percent-steel frame alone. This makes for a truck that feels light on its feet; add in the all-new FRD shocks, and the ride you wind up with is comfortable and smooth. Capability hasn't been compromised, though—max payload has increased to 2,300 pounds, and trailer tow capacity increased to 12,750 pounds. And the smooth-shifting, unobtrusive TorqueFlite eight-speed automatic transmission pairs nicely with the perfectly competent 5.7-liter Hemi V-8, which produces 395 horsepower and 410 pound-feet of torque. Additional impressive tech I took advantage of: the new electric parking brake; the electronic tailgate mechanism, which can be controlled with the fob (while you're wobbling toward the truck with your arms full) or from the driver's seat; and the LED bed lighting (unloading your loot in darkness never seemed so easy). Oh, and I'd be remiss if I forgot to mention the lovely heating and cooling seats, which warmed up my cold muscles on the early drive to my Spartan Race and soothed my beat-up legs on the way home. Additional impressive tech I didn't take advantage of: the new electronic locking differential, hill-start assist. Dark, rich tones all over this interior. The 5.7-liter Hemi V-8, while capable, is unchanged from the outgoing generation. Because of the overall weight reduction, it feels more responsive, but there haven't been any real upgrades on the engine front for the all-new truck. There are plans for a 3.6-liter Pentastar V-6 model, but that engine—as well as the the mild-hybrid version of 5.7-liter V-8—are still waiting for final EPA approval. This feels very "first world problems", but Ram offers an optional 12.0-inch infotainment screen, which I didn't get to try. My rig had the 8.4-inch display—a fine screen in its own right, but considering the size of literally everything else in and on the truck, it appeared a little undersized. 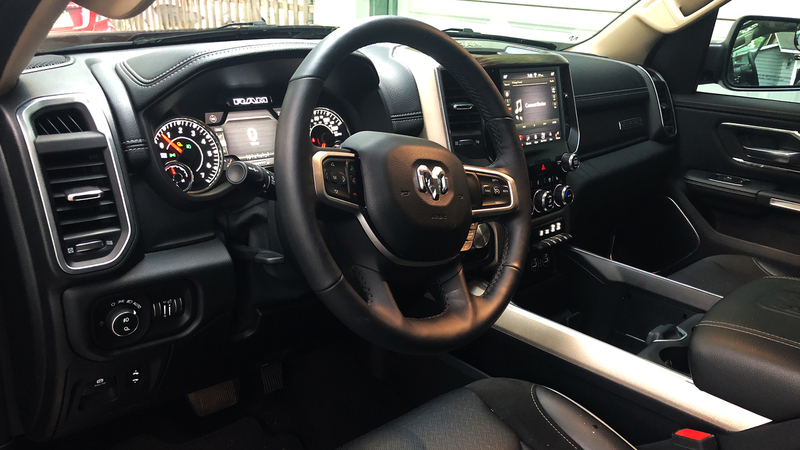 Kyle Cheromcha, who drove a new Ram 1500 with the aforementioned big-boy display (which has a split-screen capability that allows you to do things like run Apple CarPlay without it taking over the entire screen) assures me that it looks very much at home in the luxurious cabin. Speaking of options—they can add up very quickly, so this truck can get quite pricey. There are seemingly thousands of available upgrades across six different trim levels, which could be daunting for some. The blind-spot monitoring seems incredibly sensitive, and more intrusive than most. It cuts off the audio streaming through the speakers to beep at you—and it's a very jarring beep. I was driving a coworker around the streets near our office in Brooklyn when the system yell-beeped at us, and he noted that kind of feature isn't really designed with dense areas in mind. It does get your attention, but it could present itself as more of a nuisance than a safety necessity. There's a new, forward-facing air intake mounted behind that big grille. 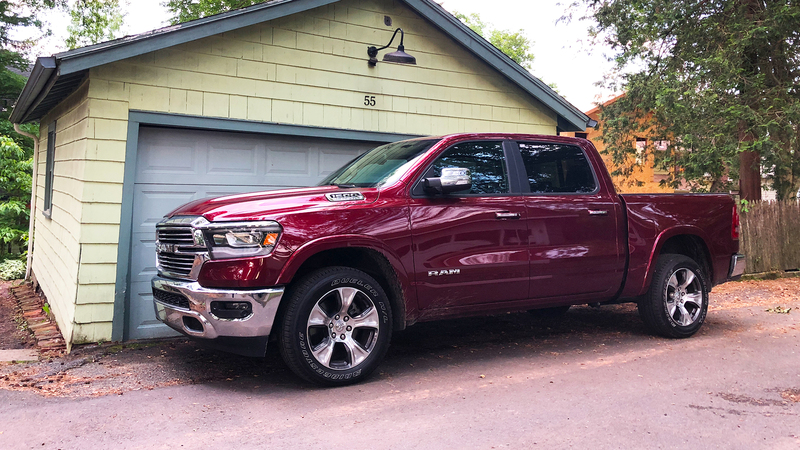 If you're in the market for a truck—as a good chunk of the masses seem to be—you're not going to currently find a better full-size pickup than the 2019 Ram 1500. Choose anything else after driving this, and you'd miss not only its interior on both design and utility grounds (Fun fact: the Ram boasts 151 liters of interior storage volume, which the company claims is nearly 100 percent more capacity than a Ford F-150 or Chevy Silverado), but you'd miss the polished smoothness of its ride. 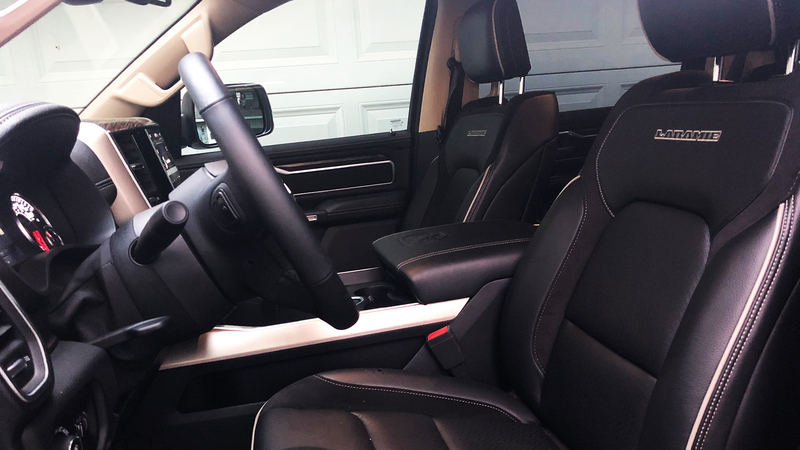 I'm sure some will say they don't need or want that level of refinement in a truck, but there's a reason automakers are including these creature comforts—people want them. And if you don't really have to compromise on capability, why would you refuse?